Is being on a cell phone hurting your relationships with your significant other, friends and children? The answer is yes according to MIT professor Sherry Turkle. In her new book Reclaiming Conversation she argues that we have forgotten how to talk/relate to one another and are becoming less empathetic and less thoughtful and that the result of being always connected makes us less connected to our spouse, children, parents and friends. She cites a recent Pew Foundation study that showed that 89 percent of adults took out a phone during their most recent social interaction, and 82 percent say that doing so diminished the conversation. 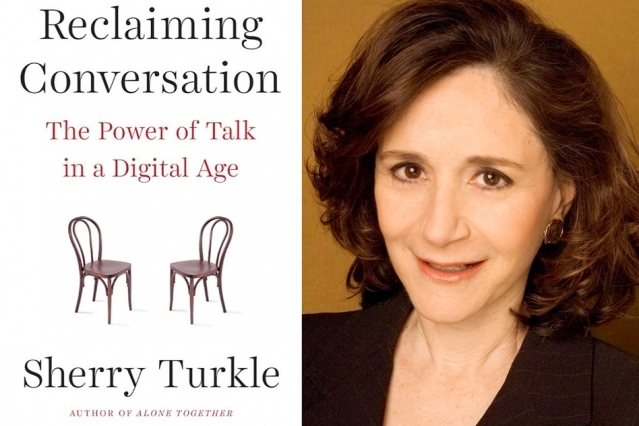 Science Writers in New York invite you to spend an evening offline, in real time, with Sherry Turkle, who will talk about her work, answer questions from the audience, and sign books that will be available for discount purchase. David Levine, SWINY co-chair, will introduce Professor Turkle and moderate the Q&A. Sherry Turkle is the Abby Rockefeller Mauzé Professor of the Social Studies of Science and Technology and Director, MIT Initiative on Technology and Self Program in Science, Technology, and Society at the Massachusetts Institute of Technology. Professor Turkle received a joint doctorate in sociology and personality psychology from Harvard University and is a licensed clinical psychologist. Professor Turkle writes on the “subjective side” of people’s relationships with technology, especially computers. She is an expert on culture and therapy, mobile technology, social networking, and sociable robotics. Previous works include four other books about evolving relationships in digital culture (Alone Together: Why We Expect More from Technology and Less from Each Other; The Second Self: Computers and the Human Spirit; Life on the Screen: Identity in the Age of the Internet; and Simulation and Its Discontents, and one book about the history of psychoanalysis, Psychoanalytic Politics: Jacques Lacan and Freud’s French Revolution. Profiles of Professor Turkle have appeared in such publications as The New York Times, Scientific American, and Wired Magazine. She was named “woman of the year” by Ms. Magazine and among the “forty under forty” who are changing the nation by Esquire Magazine. She is a recipient of a Guggenheim Fellowship, a Rockefeller Humanities Fellowship, the Harvard Centennial Medal, and is a member of the American Academy of Arts and Sciences. Professor Turkle is a featured media commentator on the social and psychological effects of technology for CBS, NBC, ABC, CNN, the BBC, and NPR, including appearances on such programs as Nightline, The Today Show, Good Morning America, Frontline, Dateline, 20/20, and The Colbert Report. Wednesday, April 27, 6–7:30 p.m.